It is important to know the differences between climbing shoes because not all are made equally. Whether you climb at a gym, local crags, big walls, or boulder fields the shoes you purchase need to meet very different criteria. We live near a world renowned climbing area with Vedauwoo in our backyard and Lander three hours away, so even if you don't climb personally, you may learn something below you can add to conversation at your neighbors next BBQ. Check out this resource, here, on climbing lingo to learn more and follow along in the blog. 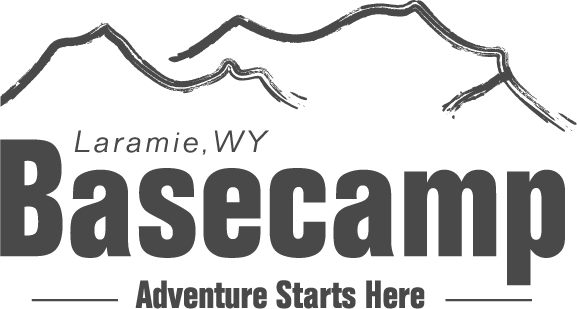 Let's take a quick look at the types of climbing shoes on the market and what we carry down at Laramie's Basecamp! Type of Shoe--Neutral, Moderate, or Aggressive? 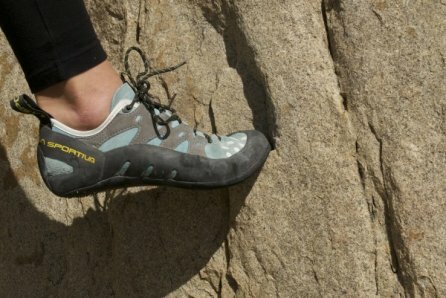 A neutral climbing shoe will offer all day comfort, perfect for the beginner or the experienced climber planning on completing multi-pitch climbs and wearing their shoes all day. Neutral shoe designs offer better support because of their stiffer soles and the flat bases make them ideal for wedging into cracks. Moderate shoes have a slightly downturned shape from heel to toe and are much better suited for technical climbs. A thinner, stickier sole on these shoes will give you far better grip and feel on the rock than a neutral shoe. Crack climbs, slab routes, multi-pitches, and light overhangs can all be tackled with a moderate shoe. For a true performance piece, we look to the aggressive shoes. With an exaggerated downturned shape and more heel tension, these shoes are not meant to be worn for long periods of time...unless you like pain. Your feet can grip tiny holds, you'll send that 5.11a you've been practicing at the gym, and overhanging climbs will be a piece of cake (trust your rubber!). Personally, the ease of a slip-on shoe or Velcro has always appealed to me but when you feel how perfect laces can adjust the fit of your shoe, you may disagree. Velcro shoes give you easy on and off abilities in between bouldering routes and at the gym when you're cheering on friends. Slip-on's are perfect for jamming feet into cracks and not worrying about the extra space taken up by laces or Velcro. Laces offer the most variety because you can loosen them when your feet sweat or tighten them to optimize your performance on difficult pitches. Material of the Shoe--Unlined Leather, Lined Leather, Synthetic? Leather climbing shoes will be the easiest to clean and deodorize but synthetic shoes offer higher performance (and Vegan's climb too!). When sizing an unlined leather shoe to your foot take note that it may stretch up to a full shoe size; you want to feel your toe knuckles pushing against the front but not see them. Lined leather shoes can stretch up to a half size as synthetic materials are added to parts of the shoe for added comfort and to reduce stretch. Synthetic shoes should be sized closer to what you want the ultimate feel to be, because they rarely stretch much. Some synthetic shoes also allow your feet to breath a little better. --Shop in the afternoon when your feet are more swollen and try on shoes without socks as most people prefer to climb sock-less. If you do like wearing socks or will be climbing in colder temps where they are needed, size up about a half size. --Try on what you are thinking of purchasing. This is the only way to know which shoe fits you the best. --Sizes vary between brands and types of climbing shoes so be open to trying on sizes that you normally wouldn't. --Have an idea of what type of routes you'll be climbing so you can find the fit that is right for you. --Climbing shoes should not be painful, but they will feel much tighter and more uncomfortable than a normal street shoe (toe knuckles should not be bunched painfully against the inside of the toe box). --If a shoe doesn't slip easily on your foot, it is probably too tight. Come on down to the store and chat with a knowledgable employee about climbing shoes and the right fit for you! Both of these climbing shoe designs come with a high-top padded ankle covering for protection from sharp rock and narrow cracks. Performance wise, these shoes do beautifully as all-around climbing shoes and especially for trad routes or crack climbs; the toe boxes are flat for all-day comfort. The Cypher Sentinel won the best value shoe in the high-top category for 2019 and the rubber, some say, is softer and stickier than the TC Pro. However, when a pro climber (Tommy Caldwell) puts his initials behind a specific shoe design, you know it must be pretty darn good. Plus he climbed the Dawn Wall in none other than these bad boyz. The TC Pro's have been rated the best all around high-top climbing shoe, they edge insanely well (even once broken in) and its hard to beat their level of comfort in a shoe that performs this well. This shoe falls under the neutral, unlined leather category--both features aid in optimal comfort and the unlined leather paired with laces help you find a near perfect fit. The Finale offers all-day comfort at the gym or a crag and while it performs OK in a crack, it is a relatively inexpensive beginner-intermediate shoe that does a lot. It is slightly more downturned in shape than the Tarantulace, although still sporting a roomy toe box, and with its super sticky rubber it offers high end edging performance. 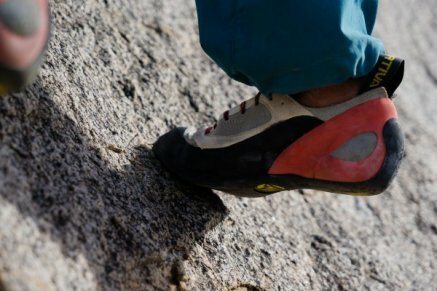 This shoe favors comfort over performance, even more than the Finale, and climbs very well up to a 5.10 (vertical climbing rating) or V.2 (bouldering rating). It has a flat and stiff midsole leading to a flat, wide, and round toe box--perfect for the beginner indoors or outdoors. The shoe is unlined leather but the inside of the tongue is lined with a synthetic pad to help manage sweat and prevent slippage. You can get away with most types of climbing in this shoe but it will not offer the same performance as the TC Pro. 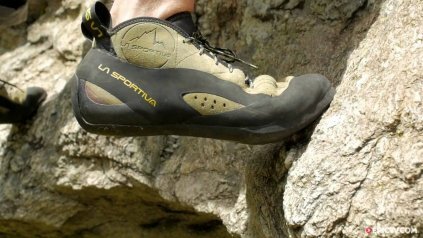 Made in China, opposed to Italy where all other La Sportiva shoes are crafted, this climbing shoe is the most affordable option we carry without sacrificing the quality of the brand.